Learn how to set up your name and the name of your clinic. Access your account details and settings. Discover how pathology and procedure videos are downloaded to your device, and how to manage your downloads. 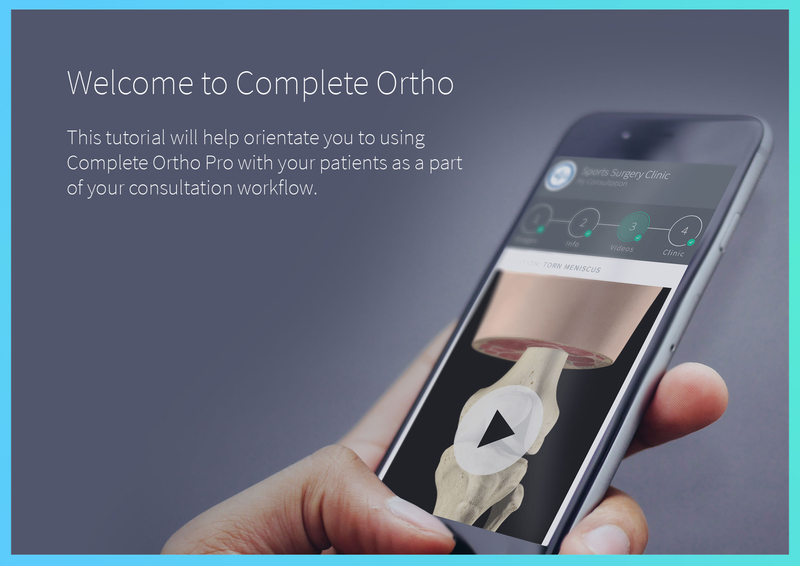 Get to grips with Complete Ortho with this handy Starter Pack. The pack walks you through setting up your account and profile, and the core functionality of the application. The pack aims to get you up and running, and sharing Digital Consultations with your patients quickly and easily. Aaron G., Adam B., Adrian K., Agnieszka S., Alan D., Alaysia B., Aleksandra J., Alexander L., Andrii B., Anthony O'C., Anton A., Austin B., Brian L., Casey G., Chris R., Ciara T., David B., David C., Declan D., Derek J., Divya M., Dmitry C., Eamonn C., Edel L., Eimantas S., Elaine W., Eoin O'C., Evgeniy I., Fillipe C., Guy A., Helen Z., Ian D., Laura W., Igor I., Irene W., Istvan Gusztav V., Iuliia B., Jake W., James Van C., Jeff R., John M., Juliusz B., Kevin A., Lindsay B., Malgorzata S., Mark L., Maxim K., Misha D., Misha V., Misha S., Mykhailo O., Niall J., Nicola N., Niko T., Pavel S., Pearse T., Prokhor S., Robert C., Roger M., Sally F., Sam Albazaz, Sam G., Konstantin S., Sergey Be., Sergey Bu., Sergey L., Shane M., Simon N., Sophie M., Spencer R., Susan R., Tyler M., Viktor S., Viktor T., Vitaliy S., Volodymyr B.